I am a composer and composition teacher/mentor with a wide range of interests. Contact me if you wish to perform some of my music or want to discuss collaborating on a film or some other project. This is the ninth in an ongoing series of blog posts by the people behind the return of A Fleeting Animal in September, 2015. Being an opera ballet performer and aficionado during my youth, I was intrigued by the opportunity to join the committee helping to produce A Fleeting Animal. I saw the original Judevine play in Hardwick, as well as the more recent one by Lost Nation Theater. This had me wondering how David Budbill’s libretto could be transformed into operatic format by composer Erik Nielsen. Well, I wasn’t disappointed when I saw a video of the first production and am looking forward to the new live productions in September 2015 at various venues in northern Vermont. The opening scene is riveting, the variety of musical styles provides a “tour” of the seasons of the year, and the libretto kept me spellbound. Antoine singing his lines operatically works for me. The score covers blues, jazz, fiddle tunes, and more contemporary sections, some reminiscent of Britten and Menotti. The staging includes a virtual Greek chorus, providing yet another dimension. A critical component of the experience of this work is how it shakes me from the sheltered state so many of us enjoy. Like others, I am “comfortably numb,” quoting Pink Floyd, and enjoying life in a country free of the scourge of war—or so it might appear. I can’t imagine what it would be like to serve on a battlefield, whether it be in a jungle, the mountains, desert, or a town or city. But I see some of the effects war has on people who have been there–from my dad being injured at the Battle of the Bulge and reluctant to talk about it, to friends who must face Post Traumatic Stress Disorder (PTSD), brain injuries, and loss of limbs on an ongoing basis. The lasting emotional effects of wartime are palpable in this opera. The production will also spur additional activities to raise awareness of PTSD throughout northern Vermont and especially in the performance communities of Barre, Hardwick, and Randolph. We’re planning some art exhibits. Discussion groups will be formed after certain performances to give people an opportunity to share and talk through their experiences. The hope is that communities will support the veterans in their midst through existing programs and even find some new ways to do so. Since the opera is based on characters from Vermont’s Northeast Kingdom, it’s even more personal to us who live here. We witness the love between a recently returned war veteran and a young single mother. We see how coping with tragedy is different for each person. We learn about ourselves and how we can help others. We can appreciate the humor, courage, and spiritual message of this work. It is inspiring to me and hope you will be inspired, too, when you experience it. Back to the A Fleeting Animal. This entry was posted in A Fleeting Animal on April 29, 2015 by Erik Nielsen. This is the eighth in an ongoing series of blog posts by the people behind the return of A Fleeting Animal in September, 2015. Yesterday morning, fourteen months of copying A Fleeting Animal — turning my hand-written score into a music software document — came to an end. I must say I feel a sense of accomplishment, even though, as the title says, this is only the end of the first stage of the process. What was more important for me to notice was how much I am still moved by this piece, almost fifteen years after seeing it for the final time on stage. The end of the first act made me take a deep breath because it was so powerful. Tommy’s death and Grace’s descent into madness at the end of the opera brought me to tears multiple times. I don’t know why this is, but I have an idea. Earlier this week filmmaker Susan Bettmann, who made the outstanding documentary about pianist Michael Arnowitt, Beyond 88 Keys, came with her crew to interview me. She is making a film about the revival of A Fleeting Animal and all of us at Right Here Productions are thrilled that this will give people an inside look at the process. During our interview I spoke about how much the story, taken from David Budbill’s Judevine, meant to me. It had everything I was looking for in writing an opera: a powerful love story, fascinating and wonderful characters, and a social context that spoke to many of the issues faced by the characters. Those problems are still with us today: the difficulties returning veterans face, mental health issues, rural poverty, racism. The characters, flawed as they (and we) are, bring out our sympathy. We are moved by their stories and troubles that are both specific to Vermont and universal at the same time. It’s this combination of living, breathing characters and the social realities they represent that tapped into a deep well of emotion in me just waiting to be drawn up and turned into music. The fact that the work still moves me so strongly tells me I must have done something right. But I’m not finished yet. I have learned a great deal about composing in the last 15 years. This has allowed me to see places where I can make the music even more powerful and accessible. The revision process is Stage Two and it begins Monday! This entry was posted in A Fleeting Animal on February 20, 2015 by Erik Nielsen. This is the seventh in an ongoing series of blog posts by the people behind the return of A Fleeting Animal in September, 2015. Nearly a year ago when David Budbill asked me to be on a board to revive A FLEETING ANIMAL after a 15 year hiatus, I said that I had been a huge admirer of his work for over thirty years and gladly accepted. What a year! It has been a privilege to get to know and admire Erik Nielsen. I have had the opportunity to work with an incredibly diverse board with respect and excitement as we set about meeting somewhat lofty goals. AND we are doing it! Our venues are secured; fundraising, though often challenging, is moving forward; musicians and cast members are being hired; and a documentary chronicling our progress is being filmed. Each monthly board meeting seems to end with even greater energy and enthusiasm as we move forward. All of this is enhanced by the positive response from those we approach and add to our A FLEETING ANIMAL community. I am grateful for the opportunity to be a part of bringing this Opera from Judevine back into the public consciousness dealing with issues which, unfortunately, are as pertinent in today’s world as they were fifteen years ago. Perhaps with this production, there can be a further awakening to the needs of suffering individuals all around us which are too often ignored. This entry was posted in A Fleeting Animal on February 6, 2015 by Erik Nielsen. This is the sixth in an ongoing series of blog posts by the people behind the return of A Fleeting Animal in September, 2015. More big news for our revival of A Fleeting Animal: we have been featured in the latest Vermont Arts Council blog post, written expertly by Susan McDowell. You can read it at http://www.vermontartscouncil.org/blog/a-fleeting-animal-returns/ . Second, through the generosity of almost 75 donors, I have surpassed the $5000 goal in my Hatchfund campaign so I will receive the funding. (With Hatchfund, like many other crowdfunding platforms, if the goal isn’t reached by the deadline, the applicant gets nothing.) Not only does this mean I can more fully devote myself to copying and revising the opera, but any amount over $5000 will go toward the production of A Fleeting Animal itself. If you wish to see how the campaign is doing before the Thursday deadline, go to http://www.hatchfund.org/project/revising_a_fleeting_animal . If you haven’t already donated, please consider giving to help me make my “stretch” goal of $6000. And thanks to the many, many folks who have already donated. This entry was posted in A Fleeting Animal on December 16, 2014 by Erik Nielsen. Update: wonderful progress on several fronts! This is the fifth in an ongoing series of blog posts by the people behind the return of A Fleeting Animal in September, 2015.
however did not preclude future seasons. More about that later. Now, for the good news. an expert job conducting the première and will return for the new production. Music Hall in Randolph (Sept. 20). — with audiences demanding more. Artists program in more intimate — and decidedly less costly — operas. contemporary yet easily accessible. In fact, it’s riveting. Vermont opera continues to have its woes, but it also continues to thrive. Please put A Fleeting Animal in your check’s memo. Please put A Fleeting Animal in the “purpose” field. This entry was posted in A Fleeting Animal on November 25, 2014 by Erik Nielsen. This is the fourth in an ongoing series of blog posts by the people behind the return of A Fleeting Animal in September, 2015. This entry was posted in A Fleeting Animal on November 3, 2014 by Erik Nielsen. This is the third in an ongoing series of blog posts by the people behind the return of A Fleeting Animal in September, 2015. Fifteen years ago, I was in treatment for Stage II Breast Cancer. I had just started chemotherapy and someone invited me to attend a production sponsored by Vermont Opera Theater, as a diversion. The production was “A Fleeting Animal” by Erik Nielsen and David Budbill. I was transfixed. This was an OPERA, written and produced right here in Vermont! I didn’t have to travel to Boston, Saratoga, or Montreal. This was a WONDERFUL opera – based on the Judevine stories of David Budbill, music by local (and national) composer Erik Nielsen. This was more than a diversion, this was 2 hours of beauty, joy, and sorrow! The tragic story of Grace and Tommy, set in the Northeast Kingdom, with well-developed and recognizable characters like Antoine and Doug and James and William. There was poetry (from Tommy to Grace, from the Angel of Depression, from the villagers playing softball in the summer twilight), there was action (gunfire, logging, softball again), there was pathos and there was tragedy. And then, this past year, I was absolutely thrilled when Erik played us an excerpt of the opera in our Music Appreciation Class. I was more thrilled when he decided that it was time to re-produce the opera. And I was tickled pink to be included in the effort to raise money, friends, and publicity to put this opera back on the stage in central and northern Vermont. We’ve done a lot of good work so far, raising money and friends. We have a long way to go, but, by the Jesus, we are going to get there! I am so looking forward to this wonderful event and surpassing its previous reach and impact. This entry was posted in A Fleeting Animal on October 6, 2014 by Erik Nielsen. This is the second in an ongoing series of blog posts by the people behind the return of A Fleeting Animal in September, 2015. When Erik came to me with the idea of turning a part of JUDEVINE into an opera, I, of course, said yes. After we decided on which part of the play we would use for the opera, almost immediately, I came up with the idea of including some black characters. I have an especial interest in Black Americans and their plight (see my latest play DIFFERENT PLANET: go to my website: www.davidbudbill.com/ and plays. It’s the top one.) and this was my golden opportunity to address that interest. As everybody knows, Vermont is one of the whitest states in the United States. Where and how was I going to incorporate some black folks? Simple. Tommy Stames leaves Judevine, Vermont, and goes to Vietnam where he becomes friends with two black guys who subsequently visit Tommy, and Grace in Judevine, in their trailer down along the river. In the scene at the beginning of Act II, “At the Landing”, Doug refers to the two black guys Tommy has visiting him as “darkies” and “jungle-bunnies.” He does this to goad Tommy into a fury over his, Doug’s, racism. It works. It all seemed so natural to add the two Black guys, since, although not of the same race, they were from the same class in the society–for lack of better words, from the working class, the working poor, that strata of society that fights all our wars. Adding two black characters was easy enough, and while I had the play broken open, I could write new parts for Tommy and Grace also, which I did. And then there was the matter of the Angel of Depression. Tommy, in his poems for Grace, in a book called OH! in the book JUDEVINE (a book within the book), Tommy mentions the Angel of Depression a number of times. In OH! she is only referred to, but Erik and I saw an opportunity to make her into a character in the Opera and we did. There is a piece of a scene (Act II, Scene 2) between The Angel of Depression and Tommy that, I think, deepens Tommy’s struggle with his depression. There is a picture (in rehearsal clothes) from the original production of Tommy and Grace and the Angel of Depression. If you’d like to see it, it’s at: http://www.davidbudbill.com/262/a-fleeting-animal. Scroll down to the first picture. Additionally: I expanded the argument between Bobbie and Doug about Grace, ending with Bobbie telling Doug he can find his own way home and Antoine telling Doug that he’ll take him home. Tommy, Grace, William and James then engage in a discussion about who their people were and are now and Grace confesses that, although she wants to feel at home with William and James, she just does not. This is followed by a Dream Sequence in which Grace, Tommy and the Angel of Depression sing to each other about Tommy’s upcoming death. Then some comic relief, sorely needed by now. We see the town playing softball and Grace watching Tommy. This scene also gave me lots of room to create plenty of double entendres. Scenes 4 and 5, in Act II, are a Pastoral Interlude in which Tommy and Grace, William and James sing to each other about how beautiful their lives are or could be. Then the scene this entire opera has been building toward: Tommy’s Death. Scene 6: Act II: Grace, now alone, warns the people of Judevine that if they don’t wake up and start dealing with the veterans of Vietnam and their survivors that they will have hell to pay. Then a final chorus, in which Grace, having lost her mind, talks about her new boy-friend in New York, then meets William and James and doesn’t recognize them. The Angel of Depression, William and James lead Grace off. The Angel of Depression has the last lines. The opera is done. What appeals to me about this opera is that music heightens everything. Music makes the emotions more intense and devastating. It ups the ante on everything. For someone like me, who wants to tear your heart out, music is made to order for what I want to do. Make a tax-deductible contribution for this opera through the Monteverdi Music School, a registered 501(c)(3) non-profit organization. Please put A Fleeting Animal in your check’s memo line. This entry was posted in A Fleeting Animal on September 17, 2014 by Erik Nielsen. 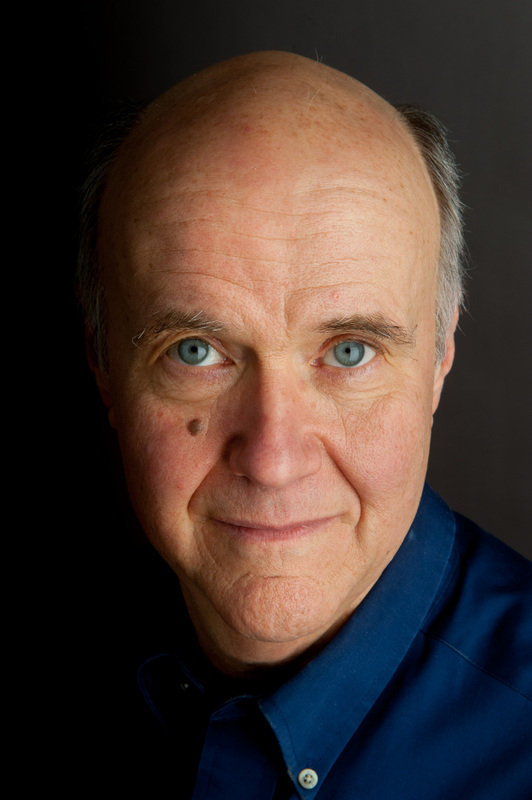 This is the first of a series of blog posts about the return of A Fleeting Animal, my opera collaboration with Vermont writer David Budbill. The original production was highly acclaimed in 2000, and over the years, people have been asking when it would be staged again. At last, we have an answer: September 2015! A dedicated committee, called Right Here Productions, is in the process of booking six Vermont locations and raising funds for a thoroughly professional set of performances. This new production is made possible with the help of Monteverdi Music School of Montpelier, acting as our fiscal agent. We’re off to a great start and invite you to join other early donors who are helping us raise the funds needed to secure contracts with the musicians. Contributions in any amount are welcome! Fifteen years ago at this time I had just begun composing music for an opera, a commission from Vermont Opera Theater. While I had yearned to work in this medium for 25 years, this was my first opportunity to do so. I was both excited and scared. I wanted to use a Vermont story for the libretto. I looked at several other works, but kept coming back to David Budbill’s Judevine. I’d never met David, but I called him up and asked whether anyone had ever created an opera from the play and if not, whether he’d be willing to work with me on one. He replied “no” to the first question and “yes” to the second, and we were off and running. Out of all the story lines in Judevine we decided to concentrate on the love and tragedy of Tommy, the returning Vietnam veteran, and Grace, a poor single mother from the small Northeast Kingdom town, as it presented the most suitable central narrative for the opera. We called it A Fleeting Animal, taken from the title of a poem Tommy writes for Grace in the play. Once the libretto was mostly finished I went to work with a formidable task ahead of me: to craft a full-length opera and have it ready so it could be rehearsed and then performed in October 2000. Somehow I managed, mainly because David’s characters and their lives were absolutely compelling and drew me in. I finally understood what the Russian composer Igor Stravinsky meant when he said that he was the vessel through which the Rite of Spring passed. It felt at times as if the piece almost composed itself and I only acted as the scribe writing down the notes. In any case, despite many obstacles, the premiere performances were wonderful, and the cast, instrumentalists and artistic directors created moving experiences for audiences, themselves and us creators. Naively, I expected the piece to take off, to garner offers for performances elsewhere, but I quickly learned that little is harder to do in the artistic world than to get a second set of performances of an opera. And so, despite our best efforts, A Fleeting Animal lay untouched for 13 years. That is, until two members of my music appreciation class approached me last fall. They’d been talking with Joan Stepenske of Vermont Opera Theater, who told them about A Fleeting Animal, and they asked me to discuss it in class. When I did, the response was so positive that I felt energized and determined to bring it back. David and I met, agreed on a timeline and a plan of action that included putting together a committee to help us. In May of this year Right Here Productions was born. With its creative and energetic members, we’ve already made more progress than I thought possible. While we’re raising funds, I’m hard at work re-copying the score and revising parts of the opera for this new production. We’re expending a lot of energy because we all believe passionately in this project. A Fleeting Animal is coming back! Stay tuned for more updates from other Right Here Productions members. This entry was posted in A Fleeting Animal on September 1, 2014 by Erik Nielsen. 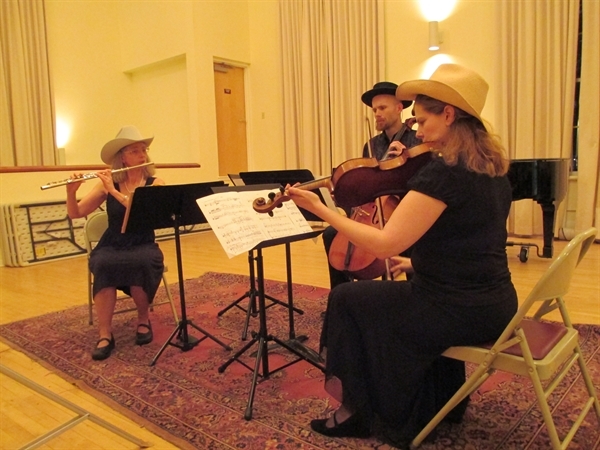 This past week I was treated to three lovely performances of a program of 21st century music. The musicians were the Passeri Trio. 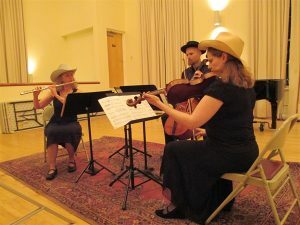 Its members, flutist Lisa Carlson, violist Elizabeth Reid, and cellist Michael Close, prepared and performed music by Michael Isaacson and the late Sylvia Glickman, but also played works by three living Vermont composers. The trio premiered Mike Close’s Tombstone, guest pianist Alison Cerutti gave the first performance of Dennis Bathory-Kitsz’s Scalar Rainbows. My own Another Take (for solo cello) and Voices in the Wind (for flute and viola) were on the program as well. The concerts were well performed, enjoyable, and enthusiastically received by the audiences. This made me reflect on how fortunate composers in Vermont are in one important respect. We live in a state where many musicians look on performing works by local composers as part of their mission. Vermont is not a state with a lot of economic advantages and that is as true in the arts as in any other sphere of activity. But its small and primarily rural character as well as our harsh winters and economic difficulties have helped create a sense of interdependence that has fostered many opportunities for us composers to be part of the wider community. While our economic situation is far from ideal and there are musicians who are still resistant to performing new music, there are many individuals and ensembles eager to play our works. I am grateful for their adventurous spirit and courage. This entry was posted in Uncategorized on June 18, 2014 by Erik Nielsen.